This Noise Is Ours: Arrows/Empire! Empire! 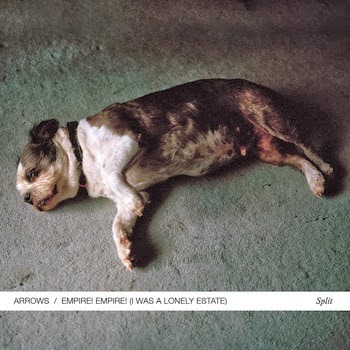 (I Was A Lonely Estate) - Split 7"
Arrows/Empire! Empire! (I Was A Lonely Estate) - Split 7"
Now on to something more sedate. I've not written about any emo/indie type stuff for a while and I had a hankering for some, so here we are. This split between Arrows and Empire! Empire! is quite old now, having been released in 2012, but it's worth looking back at. It was released by Count Your Lucky Stars Records. For those who are unfamiliar with either band, Arrows are from Brisbane (Aus) and Empire! Empire! are a male/female two-piece from Michigan (USA). Empire! Empire! are due to tour Europe in April, including a date in Leeds. Arrow played alongside This Will Destroy You last year on their Brisbane date. Beginning with Arrows, this 7” immediately reminds you of summer nights. I don’t know what it is about emo/indie songs. All Passwords Are Brisbane tells a story, the music is mid-paced with plenty of jangly guitar. It’s calming and tugs at your heart-strings. Empire! Empire! follow Arrows with two similarly laid-out songs. Turbo Stasis has a Brand New feel to it (please don’t shoot me down for that comparison). It plays at one pace throughout, with gently plucked guitar. We Did Not Need To Open It To Know It Was There is slightly more immediate. The percussion has more impact, the guitar is layered well. It’s also more introspective at times, with moments where the vocals rest and the instruments are left to play out the rest of the song. As with all 7”s, this is short but t does allow both bands to show-off their music. Both compliment each other well and the sincerity of the music is palpable. I really like both bands here and will definitely be tracking down more of their music. Make sure you go and and see Empire! Empire! when they play in the UK in April. You can buy a digital copy from CYLS's bandcamp page for a mere $1.50. You can copies of the second pressing of the 7" here http://countyourluckystars.bigcartel.com.